Good friends at the children‘s village (photo: B. Sulecio) Quetzaltenango is situated in a fertile agricultural region 2,400 m above sea level and at a distance of 200 km west of Guatemala City. Quetzaltenango has a population of roughly 150,000, 65 per cent of which are indigenous and speak Quiché or Mam in addition to Spanish. The region is an important agricultural, industrial and cultural centre in the country. In some rural areas of Quetzaltenango, poverty levels are as high as 93.8 per cent. People from these areas are likely to migrate, for example to the capital of the department, in search of work and a better life. Young people often abandon their studies in order to migrate, find work and contribute to the family income. Migration often leads to the disintegration of family stability and hence to increased violence or, in the worst cases, to the abandonment of children. Primary school attendance in the department is good, but of the children aged 13 to 15, only about 43 per cent are still in education. For young people between the ages of 16 and 18 these rates are even lower, with only around 20 per cent still in education. Although national programmes to improve these figures have brought some improvement in recent years, progress is slow and the economic situation of many families means that they cannot survive without the financial contribution of their children. Many of the children living at the SOS Children’s Village Quetzaltenango suffered abuse at home or were neglected by their parents. One of the main causes for this is alcohol consumption among parents. We look after children who have lost parental care, and we support young people so that they can stay in education, build a life for themselves and look into the future with confidence. 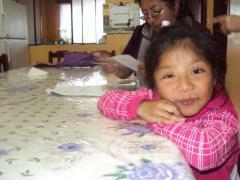 Little girl in her SOS home (photo: B. Sulecio) SOS Children’s Villages began its work in Quetzaltenango in 1979. For children in and around Quetzaltenango who are no longer able to live with their parents, 14 SOS families can provide a loving home. In each family, they live with their brothers and sisters and their SOS mother affectionately cares for them. The children attend nearby schools and are therefore very much integrated into the local community. A psychologist offers counselling to children who have had traumatic experiences or are experiencing difficulties, be they in the home or at school, and need support. Courses in a variety of subjects such as sewing, typewriting and woodwork are also offered at the children’s village, as well as monthly workshops for parents on hygiene, first aid, and reproductive health. When young people from the children’s village feel ready to move out of the family home in order to pursue further education or vocational training, the SOS Youth Programme provides shared accommodation. With the support of qualified counsellors, the young people learn to take responsibility, plan their future and prepare for independent adult life. In the town of Chiantla, about 100 km from the children’s village, SOS Social Centres offer a family strengthening programme to the local community, aiming to alleviate hardship in a holistic and sustainable manner and ensure that children are not abandoned. The centres also offer day-care and childminding programmes.